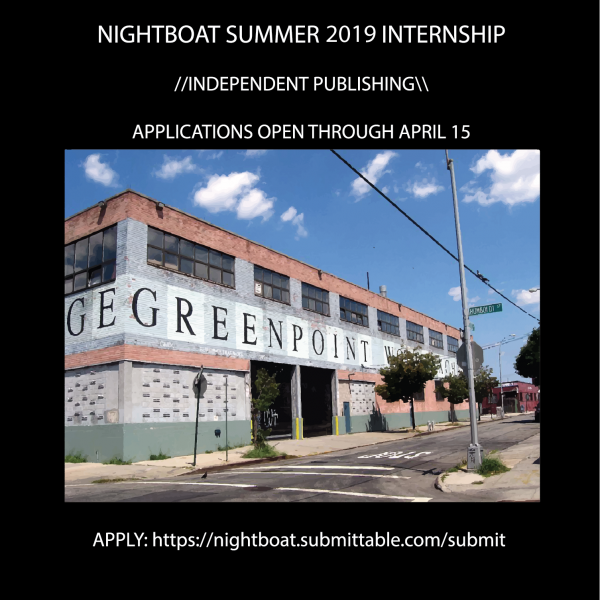 Apply to the 2019 Nightboat Summer Internship! Applications now open for our summer 2019 Internship Program! Apply to our summer 2019 internship by April 15th! 16 hours a week at our Greenpoint office, for approximately 3 months. Read and evaluate, submissions of prose and poetry. Support creation and maintenance of digital content, including the Nightboat website, blog, newsletter, social media, and more. Support in planning book launch events and logistics such as venue, lineup and promotion. Proofread, copyedit and fact check manuscripts & publicity packets. Conduct research on reviewers, magazines, venues. Read our forthcoming books and draft pitches for outlets. Assist with administrative tasks, including preparing and executing. mailings, maintaining database records, copying, filing, and sorting mail. Passionate commitment to literature and desire to support Nightboat authors. Excellent written, verbal, organizational skills. Creative problem solving abilities as well as excitement about the fast paced world of publishing. Experience with InDesign, Photoshop, any audio or video editing tools, photography, and videography are helpful, but not required.Nightboat Books, a nonprofit organization, seeks to develop audiences for writers whose work resists convention and transcends boundaries, by publishing books rich with poignancy, intelligence and risk. We are committed to publishing complicated work by a diverse group of writers. We encourage people of all backgrounds, ages, races, ethnicities, gender and sexual identities, and disability statuses to apply.